You are currently browsing the archive for the white wine category. Switzerland’s largest wine region is the Valais, basically producing 50% of all Swiss wine. Truth be known, that’s not a lot of wine volume compared to all of Switzerland’s neighbors but in relative terms, Valais is clearly the wino-spot of the Swiss slopes. Which grape then would you try if you were into trying grapes? There are a few you could locate in Switzerland without too much trouble – your Chasselas (never heard of it), your Pinot Noir (thanks Sideways for making it unaffordable), Gamay, Petite Arvine, Syrah, Cornalin (also a new one), Humagne Rouge and quite a few more. 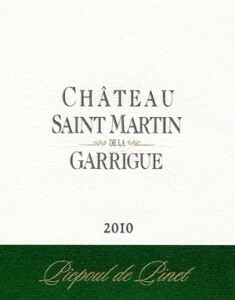 But Petite Arvine appears to the favorite of the Swiss press, people of Valais and even the wine experts. Wine gurus really ignore Switzerland for the most part and one can see why when you’re looking at dozens of regions and hundreds of grapes – it’s just a lot to put into a book. Take Karen MacNeil, for example. She wrote 901 page book called “The Wine Bible” that you’ll see fairly often in wine bars and it has a great introduction to the wine regions of the world. 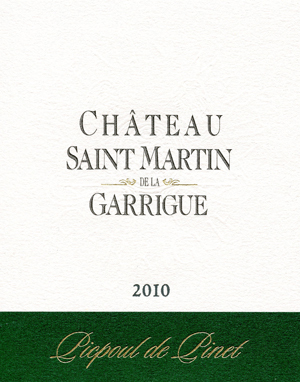 There is exactly 1 page dedicated to Switzerland, and Petite Arvine receives accolades such as – “intensely floral, exotically fruity” – and is even noted as “far more interesting” than certain other Swiss varieties. Pretty decent phrase when you’re considering that all of Switzerland fits on one page, and in fact, it’s the highest praise for a Swiss grape in the book. Jancis Robinson (my personal favorite and secret crush – pun now intended) barely notes the grape in her encyclopedic “Vines, Grapes and Wines,” including it on a list with other Swiss grapes, and Oz Clarke of much fame heaps praise on the grape (“high quality”, elegance, finesse, “unusual minerality” are some of the words he chooses) and noting that he has a bottle of 1969 Petite Arvine in his cellar. Perhaps a bit of showing of his cellar of course, but clearly he’s proud of this bottle and this grape. Tastes like green. Green apples, some green lime and NZ Sauvignon Blanc. Tastes a little rounder with slight pear, peach and quince. Not much of a finish – some green apple but finish ends quickly. 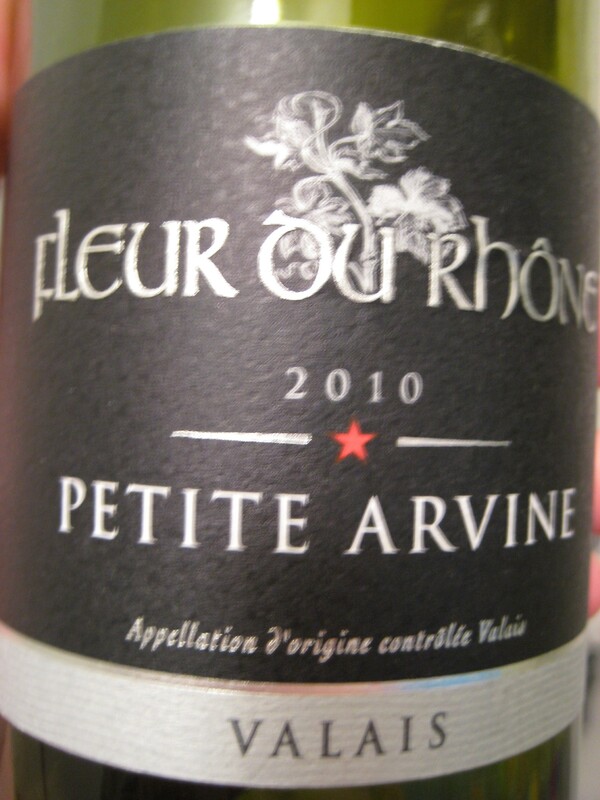 * Petite Arvine received its name because there used to be a grape called Gross Arvine. Marketing people can tell you which grape has survived… even though Gross Arvine is still in grape stock libraries, just not in bottles. 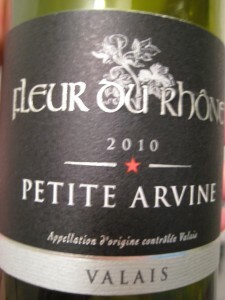 Nowadays, Petite Arvine is being positioned as just Arvine by the (surprisingly in-existence) Swiss Wine pushers. * Petite Arvine might be the most frequently grown grape of the Valais but Chasselas is king when it comes to acreage planted in Switzerland. Being a sucker for pie charts (and pie! 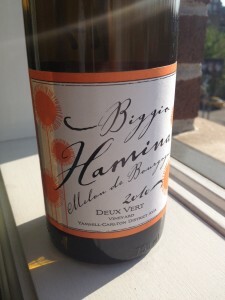 ), have a look at the dominant 8.36% position that Chasselas has compared to the puny #4 position position that Petite Arvine has at 6.46% – it sets one’s heart aflutter. If only that pesky 56.65% of “Other Wines” could be eliminated from the pie chart, this would truly be an impressive display. * The other place in the world where Petite Arvine grows is Valle d’Aosta in Italy, which is basically where you land when you step across the border from Valais in Switzerland. No doubt there is a Hemingway novel about this very trek. Una pizza napoloteana was an epic pizza place on east 12th street in the east village, until its owner moved cross-country to san francisco and left a whole in the hearts of quite a few pizza-lovers. Rumors abounded about a new pizza place taking over their storefront, and that the new owners might have even bought the oven from the emigrating owners. Years have now passed since that transaction took place and the new store in town is a well-seasoned restaurant with a deserved following. Excellent pies, good wine list and a few subtle surprises make it a go-to restaurant on bustling east 12th. The build-it-yourself delivery pizza isn’t exactly a favorite of mine since it involves making your food – exactly the activity you are trying to avoid when ordering delivery… In the case of the white anchovy pizza however, there is an exception to be made. Earlier that evening was a tasting of some red wine from two different years (2009 and 2002, I believe) that we had bought in Oregon and saved to share with friends who would also geek out about trying the same wine, from the same plot, from two quite distant years. Surprisingly enough, it was pretty easy to tell the difference (even if nobody was really going for a scientific, blind tasting). Fruity and colorful, versus dusty and subdued. Might have been reading too many wine books but it certainly seemed to match what people have said about how wines age. Lots of acidity to punch back at the white anchovies draped across the top of the pie and long long finish to keep you remembering how to spell the word “salinity.” Light, crispy, acidic white wine. Not much nose. Lemon and green apple. Surprisingly long finish. 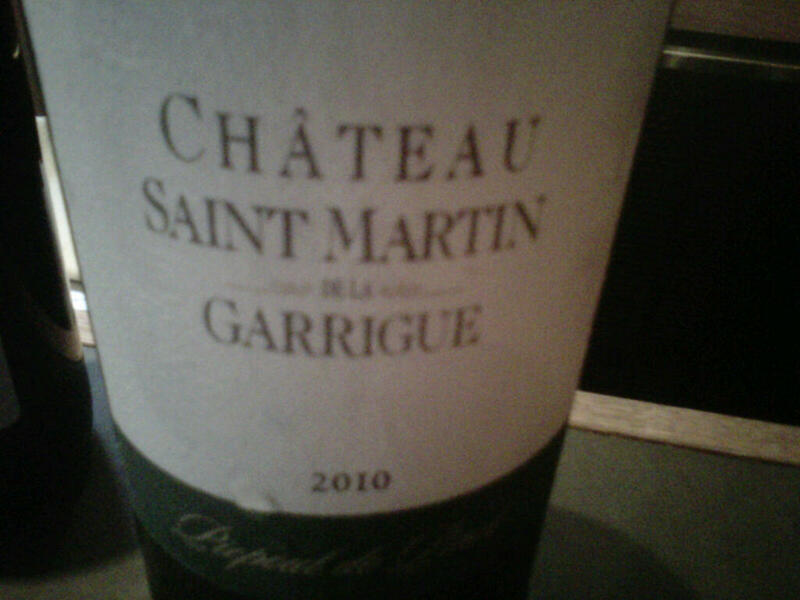 Excellent with white anchovies. * Element 34 is Selenium. Yes, it’s entirely unrelated to the rest of this post. 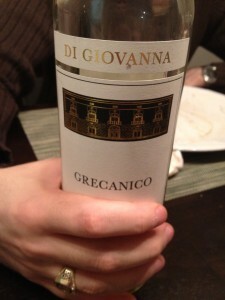 Gray wine – least appealing way to market a wine and yet, it’s a pretty cool process. So most of the time red wine comes from red grapes, and white wine comes from white grapes – not always, but it’s close enough for grenade range. 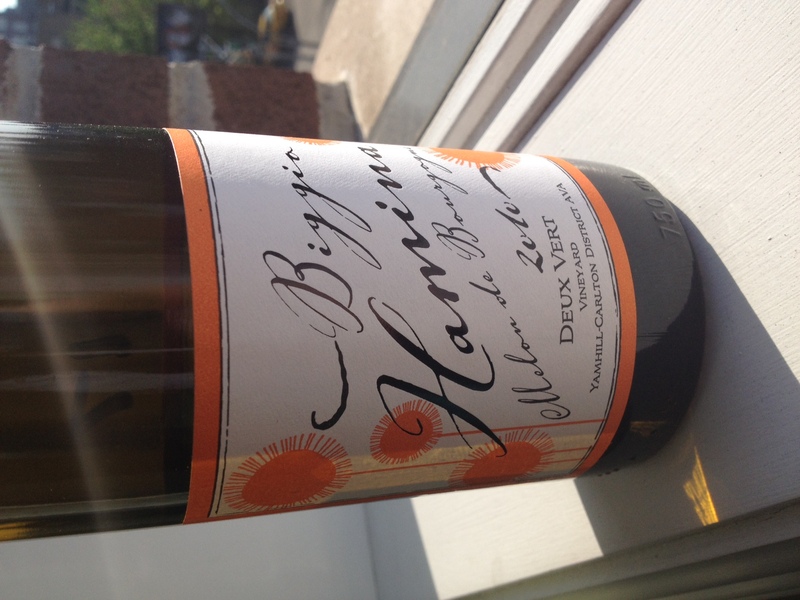 Vin Gris though, is a white wine that comes from red grapes. You take the red grapes, smash them and then move the liquid quickly before the skins of the grapes have time to start staining the wine red. Theoretically it would seem possible to make it from any red grapes, although wine makers stay away from that and stick to a very limited number of grapes: Moschofilero, a rare Gamay and Champagne made from Pinot Noir. Moschofilero is really the true vin gris, both because that’s really what people do with it and because it’s indigenous to Greece who have been making wine arguably longer than anyone in Europe. They didn’t invent wine though – that’s probably the Armenians. Strangely enough though, Moschofilero has gray grapes, rather than red that Vin Gris usually relies on – not entirely sure how this categorization works but apparently it still qualifies as Vin Gris. * Moschofilero – not related to Muscat at all. Pretty opposite in taste from the sweeter Muscats too. Piquepoul is the grape, but Picpoul de Pinet is the wine made from the grape if made exclusively from Piquepoul grapes. At least, that’s the rule in the really southern and untrendy part of France known as Languedoc. But then again, Piquepoul has a long history in the region, dating back to before there were monks and chateaus. Napoleon III loved this wine, but that was way back in the 19th century, and nobody is quite sure what Napoleon III did other than inherit a name. P.S. Was there even a Napoleon II? Ok, thanks wikiworld – there was a Napoleon II, who died of tuberculous at the legal age of 21 after calling his mother “kind but weak” so he doesn’t feature in the Piquepoul tale. Sorry little dude. Round full body – long clean finish. Some acidity but supporting cast. Fennel smell says bartender. Perfect for barbeques says the well-known importer Kermith Lynch. * Picardan, a historical sweet wine from the 17th and 18th centuries, was from Languedoc and Piquepoul was one of the grapes used to blend that sweet, extinct wine. * Chateauneuf-du-Pape, the expensive wine from the Rhone, has Piquepoul on the list of 13 permitted blending wines. The last time anyone counted, in 2004, about 0.15% of the region planted Piquepoul. * “Lip-stinger” is the original translation of the grape, referring to the high acidity of the grape in the Mediterranean. When you name a grape “Melon de Bourgogne” you could at least make sure it is a grape from “Bourgogne.” But no, that’s what you call a grape from the Loire Valley, much to the west and to the north of the Bourgogne/Burgundy region. It’s no surprise then that people just refer to the grape as “melon” but again, confusion reigns. The wine tastes nothing like a melon – this grape is pure citric battery acid. So, maybe the most famous wine made from this Melon grape would be somehow memorable or related to Melon. Again, no. “Muscadet” is the (somewhat) famous Loire wine that is made from Melon de Bourgogne, and pairs well with oysters and haters of etymology. In summary, (1) Melon de Bourgogne is from the Loire, (2) Melon tastes like limes, and (3) Melon plus oysters is a fantastic combination. Enough to baffle anyone trying to understand the grape. Like brushing your teeth, this is the complete dental hygiene package. Smells like toothpaste, the kind with extra calcium – in wino lingo, “chalky.” Taste is rigid and acidic with loads of citrus – want to say lime and tangerine mostly. Pretty thin finish but on the clean side, so it really does feel like your teeth are clean, clean with a lime twist. * Dutch traders brought the grape from its ancestral Burgunday home to Brittany, the part of the Loire Valley that meets the Atlantic. Yes, it once lived in Burgundy but got banned by Philip the Bold because it produced bad wines and took up permanent residency in the Loire Valley. * Oregon produces a fair amount of the Melon. They were hoodwinked. Stewart Vineyard brought the plant in during the late 1970s, thinking it was Pinot Blanc and marketed it as such for a number of years. Only later was true Pinot Blanc brought to Oregon.